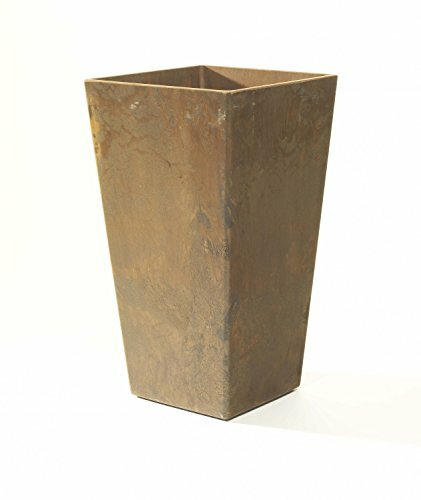 The Ella tall planter will enhance your indoor or outdoor decor with its modern, tapered, & unique design. Made with a proprietary blend of stone & resin for increased durability, you'll be enjoying this one-of-a-kind planter for years to come. In addition to its elegance, this tall square planter has a built-in Water-Minder, a self-watering component that provides continual hydration to the plants. These deep-vessel planters can accommodate larger plants, trees & shrubbery. Showcase your arrangements at every doorway, patio, deck or other living space with these beautiful, lightweight, durable, & thoughtfully-designed planters. Size dims. (L"xW"xH") bottom (sq. In.) 13.5" - 7.4"X7.4"X13.5" 5 sq. In. 19.5" - 10.2"X10.2"X19.25" 7 sq. In. 27.5" - 13.9"X13.9"X27.7" 9 sq. In. 35.5" - 15.75"X15.75"X35.5" 10.5 sq. In. For best results in sustaining healthy plants in an Ella tall planter: when using outdoors, prior to planting, invert planter & remove the rubber stopper. Removing the stopper will allow water to properly drain from the Ella tall planter. Store the stopper in safe place & replace the rubber stopper when moving your plants indoors. For additional soil aeration, add a soil amendment such a perlite, small stones, or clay piece to the bottom-and up to 1/3-of the container when deciding what to grow in the square planter. Check the planting instructions for the specific plant species. Follow the directions and, if planting multiple seeds or seedlings, place each plant the recommended distance between each plant to allow enough space between them to grow you will find a unique Water-Minder feature at the bottom of the Ella tall planter. If you remove this part during cleaning, please replace it before replanting. This piece is crucial to enable the self-watering feature of this planter. It helps water accumulate in the bottom reservoirs to recirculate & feed your plants during the growing season.